Single or multi stage separation. Fully enclosure with dust extraction port. Automatic belt tensioning and tracking. Induced Roll Separators are primarily used for separating or concentrating minerals or materials of low magnetic susceptibility. 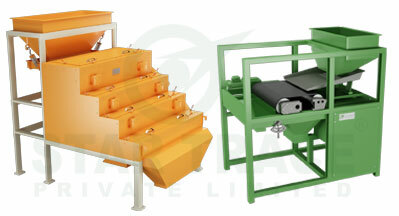 Uses include extraction of iron or chromium bearing minerals from silica sand, the concentration minerals such as wolframite, the removal of paramagnetic minerals such as Iron Titanium Oxide (Ilmenite, FeTiO3), Iron Carbonate (siderite, FeCO3), etc., from valuable non-magnetic minerals, and purification of dry granular chemical compounds and abrasives. These self-cleaning magnetic separator selectively removes magnetic components out of a conveyed material and discharges them as distinct and clean material. Field intensity is adjustable for selective recovery. Very high gauss of 20,000 is achieved by the magnetic separator. The bulk density - higher values increases throughput. Better flow characteristics increase throughput. The proportion of magnetics - a high percentage of magnetics may reduce throughput. The presence of fine particles (particularly those less than 30 microns) reduces throughput. The particle size - for most materials the maximum size which can be satisfactorily treated is 3mm. The susceptibility of the magnetic fraction - throughput is reduced for materials of lower magnetic susceptibility. The flow characteristics - these are determined by particle shape, surface condition and moisture content. For the treatment of dry materials up to 50 mm in size, electromagnetic multi-channel Pulley or Drum Separators available (details available upon request).